Fun for less = More fun. Sign up to for our e-club on the form below and receive our newsletter along with exclusive coupons and special offers on skating, skate equipment and Rolladium Family Fun Center’s entertainment activities. 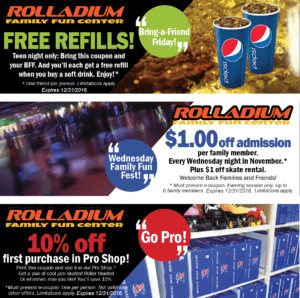 These online coupons are GREAT for saving when joining us for SKATING FUN!!! Please print out our coupons and come on in. We look forward to seeing you!